La Semaine du Goût (The Week of Taste) is an annual event, which starts the third week of October, and was initiated more than 20 years ago in France to educate elementary school children about the 4 basic tastes and to enjoy the wide range of French cuisine heritage.In Japan the event has been held annually since 2011 during the fourth week of October. 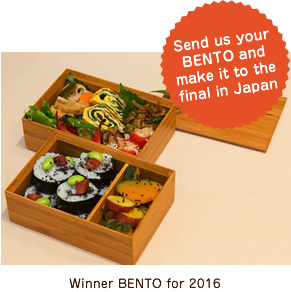 La Semaine du Goût® in Japan organizes the International BENTO Contest 2017, inviting bento recipes to be submitted from all over the world and presenting awards for the best entries. The theme of the competition this year is "Energy charge Bento" featuring well balanced BENTOs that are packed with the signature dishes from countries worldwide. Entries can be received through La Semaine du Goût® website. For more details, please refer to www.legout.jp . Nutritionally balanced and Energy charge BENTO (Own Japanese style). The candidates must post their recipes with a picture of the BENTO and the list of ingredients used on the website www.legout.jp. • The winner,the runner-up and will be determined by the panel of judges. ※Candidates willing to send their application by post, please contact us. Sponsored by Tokyo Gas Co.,Ltd. © 2018 味覚の一週間. All Rights Reserved.